Niebla Roja is the champion. He defeated Bárbaro Cavernario on June 10, 2017 in Arena Coliseo in a Torneo Cibernetico to decide the new champion with the final 2 competitors facing off in a one fall match. Other participants in the Torneo Cibernetico were Carístico, Johnny Idol, Stuka Jr., Misterioso Jr., Reaper, Drone, Polvora & Blue Panther. Title was vacant after the previous champion La Máscara was fired from CMLL on May 22, 2017. Among the singles championships in CMLL, the CMLL Light Heavyweight championship is highly respected. It has a history of long title reigns by quality wrestlers in prestigious positions. Most of top stars are light heavyweights, or are close enough light heavyweights to reasonable challenge for this championship. Shocker's championship reign was the first of a series of title changes designed to leverage the title into springboarding the new champion. Shocker defeating Villano III was part of his new role of top regular tecnico in the company. While the light heavyweight was not always the focus, the title reign and the aftermath appears to be the peak of Shocker's career. While Shocker winning the title made him a bigger tecnico, Ultimo Guerrero winning it was to firmly position the new champion as one of the rudos in the company. Ultimo Guerrero was already respected as a wrestler and had been going toe to toe with the best CMLL had to offer, but his championship reign established Ultimo Guerrero himself as the best. It's not uncommon for lucha libre championship reigns to last three and half years, but rarely are they filled with as many defenses (and those of quality) as Ultimo Guerrero's. Ultimo Guerrero lost the championship to former partner Rey Bucanero as a way to climax their split. Unfortunately, the story of the split never got over with the fans. In part because with the short turnaround from fallout to big match, the match didn't have the expected interest or level. Bucanero has been a credible champion, but when the promotion lost interest in Bucanero as a tecnico, the importance of this belt fell with him. 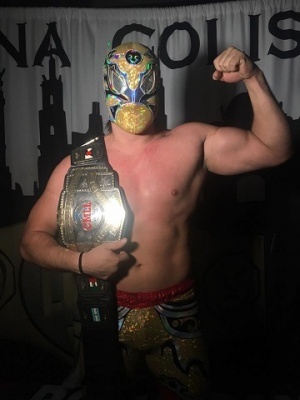 The title has had a little more meaning since Bucanero returned to the rudo side, but still a bit off to the side, like all championships which do not involve Mistico. In late May of 2009, as CMLL resumed running shows after the flu cancellations, Bucanero and Ephesto started feuding. Bucanero was not booked on the first show back, so he sat in the front row to watch the show. Ephesto bumped into Bucnaero during his match, Bucanero threw his beer at Ephesto, and the two began brawling. Ephesto's Hijo de Averno teammates pitched in and Bucanero took the worst of it. Bucanero struck back with the help of his Guerreros del Atlantida partners, and the two factions started feuding. Bucanero and Ephesto were still the center of the feud, with Ephesto scoring clean victories on Bucanero in trios matches during the short time between the feud and the title match. The May 28th match had an usual outcome. Ephesto worked over Bucanero's left knee thru the third fall, and Bucanero was unable to continue after being thrown out of the ring onto the bad knee. The ringside doctor stopped the match, and Ephesto was awarded the win and the championship. Ephesto's title win was seen as a bit of an upset, as Bucanero had been booked at a level higher in recent years. This was also Ephesto's first major singles championship win. Ephesto's championship reign was very quiet. Bucanero returned from his knee injury after nearly a year, but Ephesto was able to prove he was the rightful champion by winning in his rematch. Ephesto did not otherwise defend the championship, and lost in the first round of the first two CMLL Universal Tournaments. Rising star Rush defeated Ephesto after a short month long feud. Rush is the most recent champion. He vacated the championship on January 15,2013 and a tournament was took place to determine a new champion. This page was last edited on 31 January 2019, at 18:18.